Why vision? 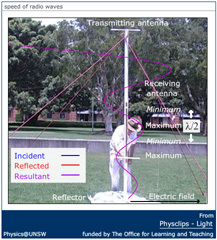 Why the importance of the 400 to 700 nm band? Why so little UV and IR vision? Why no bio-radar? 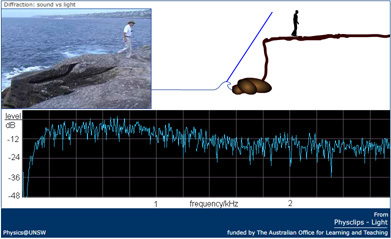 How does vision compare with hearing? Additive colour mixing by projection. Additive colour mixing on RGB monitors and phones. Newton's colour wheel. Subtractive primaries and subtractive colour mixing. Details of the experiments from the multimedia chapter. The direction of the electric and magnetic fields: transverse or longitudinal. 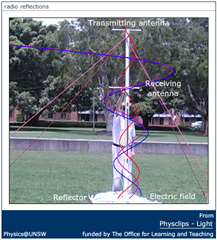 Experiments with UHF radio. 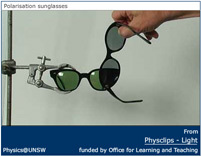 Polarised light and polarizing sun glasses. 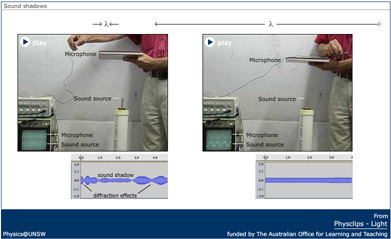 Details of the experiments from the multimedia chapter. 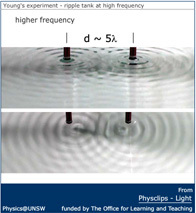 Quantisation of light - and of water! Light and photons. 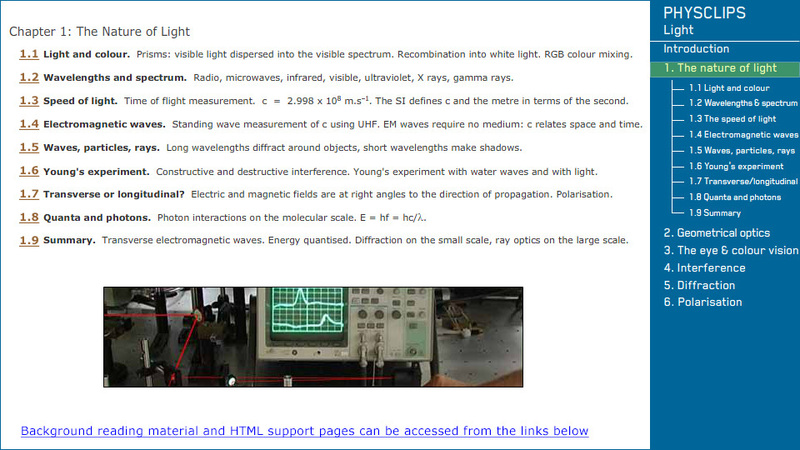 Photon energy depends on wavelength. Black body radiation. Light and prisms: refaction, dispersion and recombination. 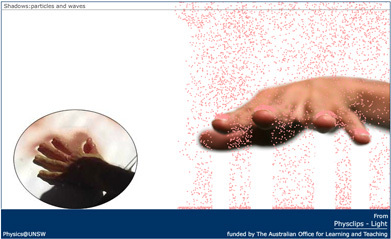 Light shadows and particle shadows: the particle model for light. Wave shadows and their dependence on wavelength. Diffraction and wavelength. Comparison of sound and light. 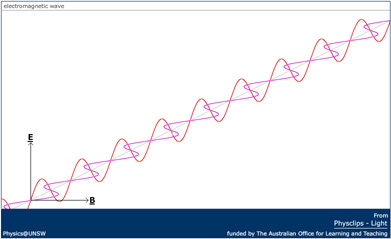 A simple measurement of the speed of light by time of flight. 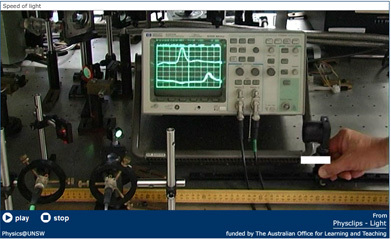 Pulsed laser, beam splitter and mirrors, detectors, oscilloscope. 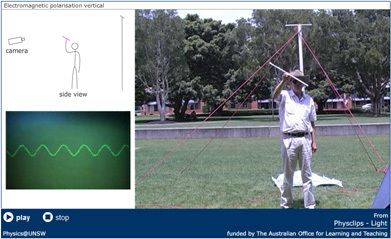 Details of the experiment from the multimedia chapter. 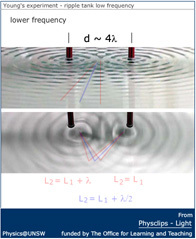 Young's experiment: comparing water waves and light waves. 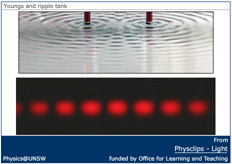 Ripple tank with two synchronised sources. Two slit experiment with a laser. Details of the experiments from the multimedia chapter. Support for this project website has been provided by The Office for Learning and Teaching, which is part of the Department of Industry, Innovation, Science, Research and Tertiary Education. The views expressed in the project do not necessarily reflect the views of The Office for Learning and Teaching.